Well, this was the best idea I’ve had all week. What a perfect way to enjoy a lovely afternoon off. Atlantic Grill is one of my local favorites for when I want to go out to treat myself. (although I am quite happy to dine with company there too). This is one of those restaurants that doesn’t bat an eye when you say, ‘Just one’. Sidewalk seating allows for great people watching. Eating at bizarre times like 3:45 on a Friday afternoon before a holiday weekend pretty much ensures the pick of the best tables, totally attentive service and a bartender happy to bring over a crisp NYT. 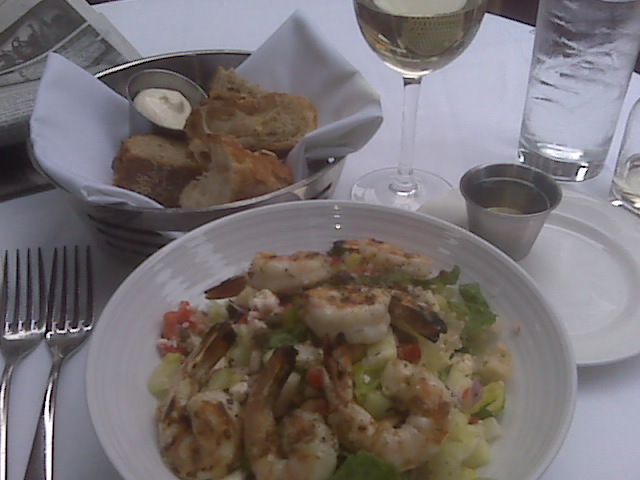 I had what I often have for lunch there, a chopped salad with grilled shrimp. The salad has chickpeas, capers, feta, olives and veggies and is so fresh and flavorful that I don’t even bother with the dressing. The shrimp are grilled to perfection with a subtle garlic/herb flavor. The basket of incredible bread is hard for me to resist- especially with whipped, fresh butter. Such simplicity, but so perfect. I should mention that I have never been less than impressed with my dining experiences here. It is a family favorite and we come in frequently. Whether it is for sushi, oysters, fresh fish prepared brilliantly, or appetizers and the most awesome chocolate fondue dessert around, it is consistently top-notch. I decide to treat myself to a glass of wine, my 3rd in a week. More than I usually drink in a month- I’m such a lush! Haha. This addition to my meal completes the ideal lunch. I sit reading the paper, occasionally distracted by fleet week hotties passing by, completely and totally content. 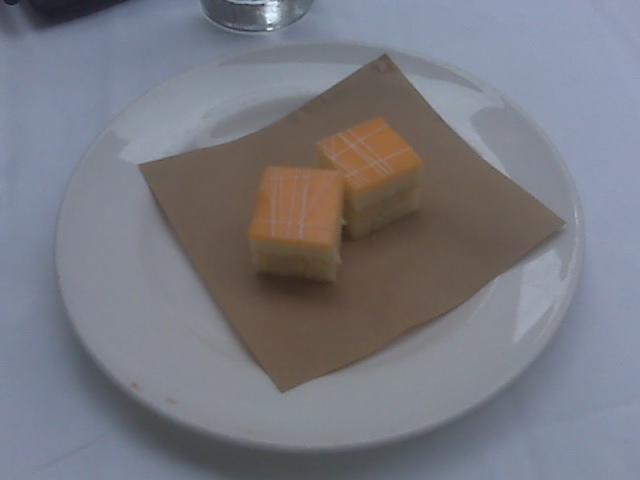 I ask for the check and mention to my waiter that I write a food blog as I hand him my card. He quickly disappears to fetch me a free taste of their new dessert, as if to challenge my thinking that the afternoon couldn’t possibly get any better. Challenge happily accepted.